The imposition of Emergency in Pakistan on the pretext of removing judicial interference in state matters and curbing the brewing terrorism menace is primarily ludicrous and secondarily grave. Pervez Musharraf, in his statement to the nation has pointedly asked the judiciary to abstain from intervening in the administration and policing of the state. Chief Justice Iftikar Mohammad Chaudhary has been asked to step down and make way for the General’s stooge. The Right to Expression has been indefinitely withdrawn as private newspapers and news-channels lurk under the shadow of the gun. 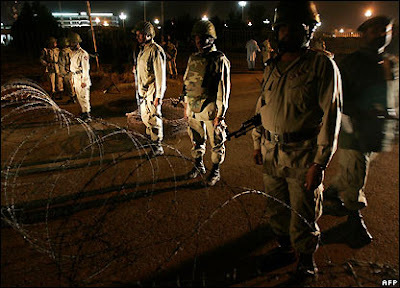 In short, the military has taken charge of the proceedings in Pakistan. And no one knows for how long. ‘Military Coup’ and ‘Martial Law’ are words that an average Pakistani child learns before he/she can spell ‘MISOGYNIST’ going by the tradition of anarchy in that country. But, standing in the 21st century, when South Asia can only look forward by adopting liberal measures, both political and economic, the move to stall democracy in a country of 160 million is but unforgivably retrograde. It is understandable that Musharraf had no other option but to clamp strictures by force to bring his house to order. The historically restive North-Western Frontiers were going out of control, the Taliban raising its hood of defiance to its old master in collusion with Al-Qaida, making it difficult for the General to save face. The Lal-Masjid incident incited extremists into action resulting in fidayeen attacks on a fortnightly basis in major cities. Whereas on the other hand civil society of Pakistan was also up in arms against the heavy handed approach to curb the Judiciary and narrow its dominion. With the comeback of Benazir Bhutto to homeland and the recall of Nawaz Sharif looking imminent he surely must have run out of choices. One shudders to imagine himself in Musharraf’s shoes right now. He is perhaps in the ‘Worst Political Soup’ of the century. Even his worst detractors must admit that he has the courage to take the bull by his horns, and tame it too. Stopping Nawaz Sharif’s return to Pakistan. That would mean a bipolar contest with only the PPP( Pakistan Peoples Party)if and when general elections are held( which surely wouldn’t be meeting its January date due to the Emergency). Cornering lawyers and judges who were in vehement opposition to his re-election. Appointing Yes-men at key posts would ensue. Blocked bills would be promulgated with urgency and made into Acts that would expedite the General’s cause. Triggering a massive military offensive in the North-Western Provinces where the army is now on the back foot owing to resilient tribal forces mounting severe guerrilla attacks. Aided and abated by the Taliban and Al-Qaida they pose a serious threat to the unquestioned supremacy of the army. A military offensive would also mean buying time from the U.S.A which is snapping at his heels to let the Marines cleanse the place off insurgents. Action would also show solidarity with the world community on the issue of Terrorism which is priceless coming at a time when he needs the much needed approval of the Big Brother to legitimize the Emergency and subsequent crackdown. Another alternative would be to let loose the extremist hounds who have been baying for his blood owing to the clampdown on terrorist training camps and funding machineries nourishing them. That would call for a vigilant India to remain on its guard and foil any attempt at escalating tension, especially with the Gujrat elections not too far away in the National Political horizon. As an avid observer of events I can only hope that sanity returns to a country which deserves its place under the Sun after a harrowing six decades of bitter rivalry and political unrest. Progress for the country and dividends for its countrymen can only ensue once there is lasting peace in its premises. If not the General, then somebody else must ensure that Pakistan doesn’t miss the train this time around. Lest it be too late this time.